Smythson "Panama" pocket notebook in cross-grain lambskin. 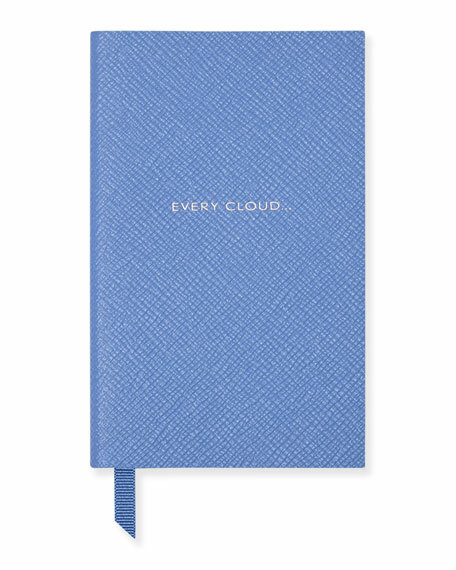 Features "Every Cloud..." text across front. Tonal grosgrain ribbon page marker. 5.5"H x 3.5"W x 0.5"D; weighs 0.2 lb. Proud holder of three Royal Warrants, Smythson products encompass a wide range of elegantly designed items for men and women, handcrafted with only the highest quality, carefully sourced leathers. Inspired by Frank Smythson's original diary design from 1908, the Panama collection bears the same cross-grain leather used over a century ago. Embodying a selection of lightweight handbags, business and travel accessories, this coveted collection ensures you depart in style, wherever you choose to venture. For in-store inquiries, use sku #137636.